Ideal for youngsters that like the security of a mullen mouthpiece coupled with the full cheeks to help with turning. This style does not pinch the corners of the mouth. 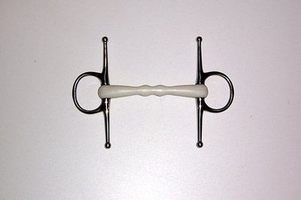 Please check your current rule book for use of this bit for dressage as we are led to belive that this style bit is no longer dressage legal due to the bumps on the mouthpiece. This style of bit is allowed for BE dressage but not for BD dressage.